With over 15,000 lakes, 32,000 miles of streams and rivers, and 820 miles of shoreline on two Great Lakes it comes as no surprise, fishing is a staple in Wisconsin. The two go together like peanut butter and jelly (or is it cheese and beer?). Fishing is a year-round activity throughout the state with target quarry ranging from platter sized panfish to lunker muskies. Proper reproduction and balance are important to maintaining fisheries in Wisconsin’s waterways. Occasionally a waterbody’s fish population may be impacted by natural factors such as lack of spawning habitat, lack of overall structure, or winterkill and human imposed factors like over-harvest. Aid in the form of fish stocking is a common method to assist Mother Nature. Stocking is commonly used to bolster established populations that may have poor or no natural reproduction, introduce new species to establish a new sport fishery or prevent over population and stunting of panfish, or add more forage (food) to grow trophy fish. Fish stocking is allowable on public and private water with a proper DNR permit or under a Fish Farm license*. Fisheries habitat is equally important in protecting and enhancing fish populations. Not all waters were created equal. Some may lack proper spawning habitat while others lack cover and protection for young fish to grow and mature. 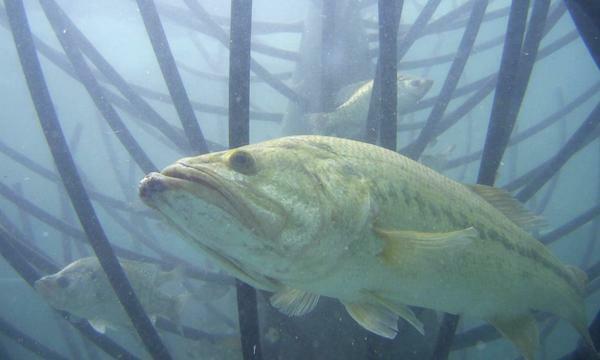 Fish structures, such as cribs, are an easy way. Typical fish cribs are made from organic materials that are difficult to transport or install, have a limited life span, and easily snag fishing equipment. Newly introduced structures are constructed of long-lasting, snag proof composite materials. These structures range from fish protection or predation areas to spawning ground enhancements and are easily installed. It’s not too late to prepare for fisheries stocking or habitat improvement. Wisconsin Lake & Pond Resource offers a comprehensive suite of fisheries options. We are your location to assist in fisheries stocking and habitat improvement from initial planning through completion and all stages in between. We are currently taking fish orders for 2019. Orders are due by March 31st for spring stocking or September 30th for fall stocking. For any questions on species availability, permitting or licensing requirements, habitat improvement options, or a quick chat please contact us at (920) 872-2032 we’ll be glad to help. *Permit or license requirements may vary. Please contact WLPR with any stocking requirement questions.